With regards to the vast amount of territories impacted by mines and artificial lights, the aim of work package 5 of GEOEssential (WP5) is to demonstrate the use of Earth Observation products methods, tools, information and services in the domains of extractives and artificial light. The primary objective is to explore the impacts of mine on ecosystems and water resources through land cover change, and the erosion of night habitats by artificial light. New indicators and essential variables will be proposed and/or computed for the monitoring of operations in the extractives and artificial light sectors. The second objective is to develop a mini data cube to analyze the environmental and societal impact of mines on water, land use and ecosystem functions. The third objective is to improve the existing UNEP World Bank geospatial platform MapX (mapx.org) that aims at mapping and monitoring the sustainable use of natural resources, with a focus on extractives for the extractive sector. It will also be sought to connect this platform to GEOSS and Copernicus. The fourth objective is to develop an online tool for non-specialists to access and analyze trends in night-lights data for user-selected areas (yearly for DMSP, 1992-2013, monthly for VIIRS DNB April 2012-present). Innovative workflows will be implemented to generate indicators and services in order to monitor sustainable development goals (SDGs). The outputs of these workflows will be transferred to WP7. A workflow is currently being implemented to compute a new indicator for monitoring the impacts of extractive activities on the environment. 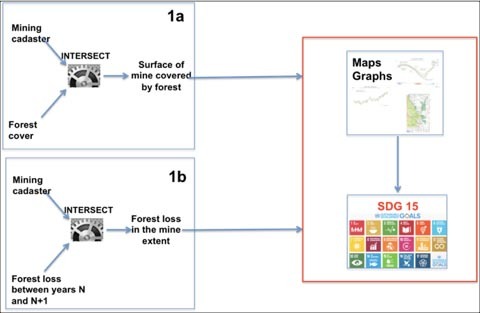 This indicator will be calculated from data derived from a spatial overlap between digital polygons representing the DR Congo mining cadastre and raster data representing forest cover (see Figure1, workflow 1a). The value of the indicator, at a given point in time, is based on data on the year of mining concessions and of forest cover is computed as the surface of forest currently recognized that it covered by mining concessions. The workflow will involve several steps, including: (1) download forest cover on the country extent; (2) mosaic forest cover tiles; (3) dissolve all mining concessions into one polygon; (4) clip forest data by the dissolved mining concession; (5) compute the surface of forest currently recognized that is covered by mining concessions. It will be sought to monitor through time the surface of forest that is covered by mining concessions (Figure 1 – workflow 1b). To that end the above-mentioned steps will be repeated for different years. It will be possible to derive several workflows from this workflow, e.g. by integrating only a certain type of mines (those producing only cobalt, or only copper), or by monitoring endangered species that are located within the extent of the mines – just replace in the workflow 1a the surface of forests by the number of animals/plants.